Every new day is an opportunity for new things, but the freshness of the season is never as evident as it at the beginning of the new year. With the new year comes new hope, new resolve, new dreams and even new strength. The first week of the new year is almost over, and I’d like to ask: How have you been doing with your plans so far? How have the first few days been? Whatever response you have for these questions, I want to encourage you not to give up. Instead of giving up, get up! The year is still very fresh; you have the opportunity to make it what you want it to be. Ride on the newness and freshness of the season and reaffirm your resolve to make this year a better year, as long as it lies within your power. I hope you have set goals, and not mere New Year resolutions. If you haven’t set your goals for the year, it’s not too late. You can use find the goal-setting posts on this blog and let them guide you on how to set the right goals for this year. Ensure that you make plans and resolve to live with purpose, passion and productivity. Purpose: Where are you coming from and where are you going? What is your objective for this season of your life? Do you understand yourself, your values and your personality? Passion: How will you do what you have to do? What kind of attitude will you bring to your daily life? Will you be deliberate about what you’re doing? Productivity: What results or outcomes will you have when you combine purpose with passion? What are your expectations? Let this be the year that you make good progress in the right things. Let this be the year you do what you know you should do. Let this be the year of great strides in every way. Let this be the year you face and conquer your fears. Let this be the year you live your dreams. 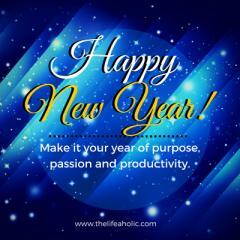 Let this be a Lifeaholic year of purpose, passion and productivity.